Make a chicken dish that's super easy and extra flavorful with our Grilled Garlicky Chicken Breasts Recipe. 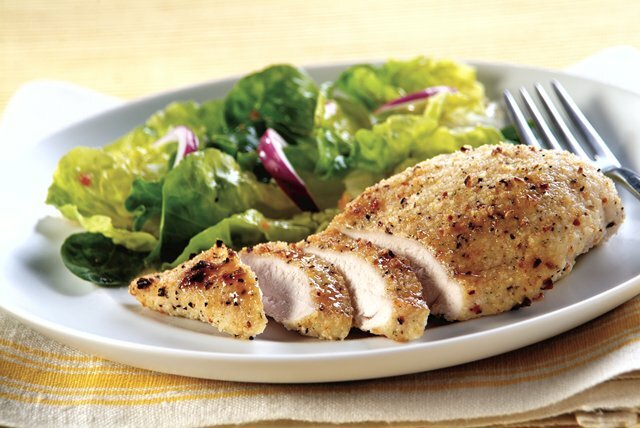 Coat chicken breasts in GOOD SEASONS Garlic & Herb Dressing Mix and grated Parmesan cheese in this Grilled Garlicky Chicken Breasts Recipe. Mix dry dressing mix and cheese in shallow dish. Moisten chicken with water, then dip in dressing mixture, turning to evenly coat both sides of each piece. Grill 6 to 8 min. on each side or until done (165°F). Heat oven to 400°F. Coat chicken with dressing mixture as directed; place in single layer in shallow baking dish. Bake 20 to 25 min. or until chicken is done (165°F). The cheesy coating on the chicken will adhere better if you refrigerate the chicken for 30 min. before cooking.